The psychological theory developed by Alfred Adler, upon which PEP bases its parenting classes. This same approach to raising children is used by thousands of parenting education programs in the U.S. and around the world. To learn more, read Our Approach. Yes. Research clearly shows that investing the time in parenting education pays off immediately and as children grow. Refer to The Research and Why PEP. Yes! Programs that have a “Register” button are accepting online registration. If you did not receive a login from PEP via email, you will need to create one to complete your online registration. The system will prompt you for the required information after you click the “Register” button. Note: To register for childcare, you must call the PEP office. Refer to Childcare Information in PEP’s Policies. Who are your class instructors? We call them “leaders,” because our educational model is peer empowerment. Our class leaders are parents who have taken the series of core classes and then completed an extensive leader training program. Is PEP affiliated with the churches where classes are held? No. We lease space from a variety of organizations such as schools, churches and other nonprofits. Can you offer classes at my school/church/community center? 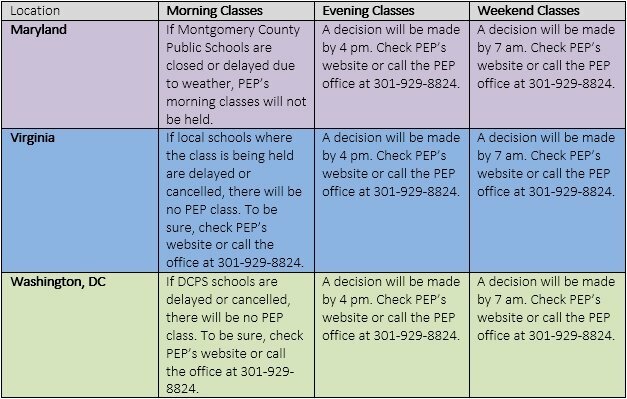 If you have a choice location for a PEP class to be held, contact our office. We review the requests for off-site classes according to our geographic plan. If your location fits within the plan, we will let you know. Do you take a waiting list for classes marked as full? Yes, we take a waiting list. If someone cancels before the second meeting of an 8- to 10-week class or before the first meeting of a 1- to 4-week class, we will contact the people on the list, in the order they were added, to see if they would like to join the class. Payment is required at that time to hold the registration. Please call the PEP office at 301-929-8824 or 703-242-8824 if you are interested in being added to a waiting list for a class that is full. What is the difference between the 8-week and 10-week PEP I class? Both classes cover the same curriculum. In the 8-week class, the material is presented in a condensed form, with less time allotted for large group discussions. I missed the first week of class. Can I still register? Yes, you can still register after Week 1 of a core class. There will be no registrations after Week 2. For our shorter courses (2-4 weeks) you cannot join a class after the first week. I’m going to have to miss a class meeting. Is there any way to make it up? You can make up a missed class by attending the same one at another time/location (if available) or you may contact your class leaders by email or phone to get the material you missed. Extensive handouts and textbook reading also cover much of the material. You may also attend up to two missed classes in the next session; call the office first to make sure there is space available. You may not make up a missed class from a 2 or 3 day intensive class or a workshop. Will PEP offer this same class in the same location next session? Not necessarily. We typically offer all of our core classes each session in Kensington (except for PEP III: Empowering Yourself and Others, which is offered two sessions per year), but other locations vary based on demand and our geographic plan. If I register and then realize that I can’t take the class, may I receive a refund? If you cancel at least 48 hours in advance of the first meeting of a core class, you will receive a refund minus a $15 administrative fee per person per class. Withdrawals after the first meeting, but before the second, will receive a 75 percent tuition refund. There are no refunds after the second class meeting. Refer to PEP’s Policies for information on refunds for shorter courses and workshops. Can my spouse and I pay one registration and alternate attendance? No. It is important not only to you as an individual but also to the dynamics of the group that you, as the registered class participant, attend each class. The material presented each week builds on information from previous weeks. How do I know if my class is canceled due to weather? I’m moving outside the Washington, D.C., area. Where can I find parenting education similar to PEP? PEP’s in-person classes are in the Washington area only. If you have ever attended a PEP class or workshop, you are eligible for an individual consult with a PEP leader, which can be done by phone. Information is on the Individual Consults page. PEP also offers online classes and workshops, accessible from any Internet connected computer or mobile device. See below for links to other Adlerian-based parenting programs. Active Parenting offers video-based parenting education and an online parenting program. If you choose to enroll, please let them know that PEP recommended it. ICASSI: The Rudolf Dreikurs Summer Institute is the world’s longest-running and most intensive international summer institute specializing in the psychology and teachings of Alfred Adler and Rudolf Dreikurs. For more than 40 years, it has brought together professionals, individuals and families from at least 20 different countries. It is the prime educational program of the International Committee of Adlerian Summer Schools and Institutes (ICASSI).Contact the PEP office if you would like to talk to someone who has attended. Does PEP offer classes or provide materials in Spanish? PEP sometimes offers childcare on an as needed basis. See Childcare Information on the Policies page. I’d like to apply for a scholarship to attend PEP classes. How do I do so? Download PEP’s Scholarship Application form, fill it out and mail or fax it to PEP. PEP does not sell, trade, exchange or otherwise make available any personally identifiable information to any other company or organization.